28.05.2013, 07:55, Calle Áncora (Photograph by Ícaro Maiterena). Early 20th century postcard depicting the Ministry of Development. According to Sibel Horada, the story of Victory and the Pegasuses , which begins on top of Madrid’s Ministry of Development, is ultimately a story of destruction, displacement,reproduction, and accumulation. It must have been 1897 when more than 150 tons of marble was set aside in the quarries of G. Nicoli in Carrara to be sent to Spain in order to fulfill an order from the Madrillian sculptor Agustin Querol. 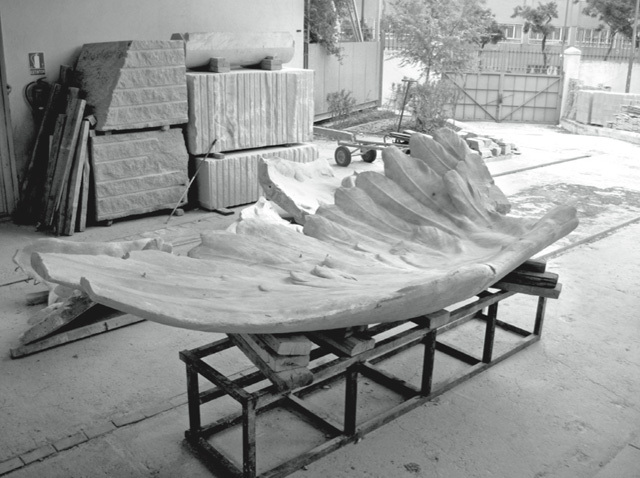 The marble blocks were loaded onto a ship in Port Alicante to be transported to Querol’s Madrid studio. Under the service of the Prime Minister Antonio Canovas del Castillo, Querol (who had won two major prizes following his training at the Academy of Fine Arts in Rome, which he had entered in 1884) received a commission for a series of sculptures to surmount a neo-classical building, constructed to house Spain’s 40 year old Ministry of Development (El Ministerio de Fomento). The monument was to communicate the Empire’s supreme vision along the ideas of progress and development. The building was situated directly across from the newly built railroad station in the city’s southeast neighborhood, Atocha. The allegorical trilogy devised by Querol represented the idea of Spain’s develop- ment by depicting a winged Victoria rising on the shoulders of the muses of Art and Science, accompanied by the muses of Art and Industry moving forward on two Pegasuses. Through this, Spain intended to remind its people of the nar- rative of a developed nation, moving forward with new discoveries, conquests, and commerce, in accordance with the values of modernity in the arts and sci- ences.These were to be represented in all of Spain’s territories, including the Iberian Peninsula as well as its offshore colonies. The fact that Spain lost its colonies in Cuba, Guam, Puerto Rico, and the Philippines within a year of the Victory and the Pegasuses commission was not going to affect the meaning of the monument. Along the trade routes discovered by explorers, merchants were going to continue to bring into Europe, the spices of India, the silk of China, the wine, olives, and olive oil of Eastern Mediterranean and the Aegean, the marble of Marmara, and the precious metals of South America. As the European bourgeoisie became wealthier, its members were going to rise up against the aristocracy, defining themselves as “citizens” and began to acquire more capital. They were going to seize increasing power through revolutions and reforms realized with the support of the proletariat and the peasantry. Great Nations and Nation states were going to be founded by the capitalist class and the masses that stood on their side. In fact, the rise of Victory and the Pegasuses in Madrid coincided with that very time when Spain was becoming a nation-state.The following destruction, displacement, and reproduction of the monument would in fact define the manifestation of the modernist spirit in twentieth century Spain. Marble fragments left on the side of the building. Image from the doctorate thesis of Montaña Galán Caballero. When a wing of one of the Pegasuses broke and shattered in 1972, the 150-ton triptych suddenly became a burden that threatened public safety that urgently needed to be discarded. In fact, the edifice was not strong enough to carry this load. Thus, the authorities decided to replace the marble originals with bronze replicas. 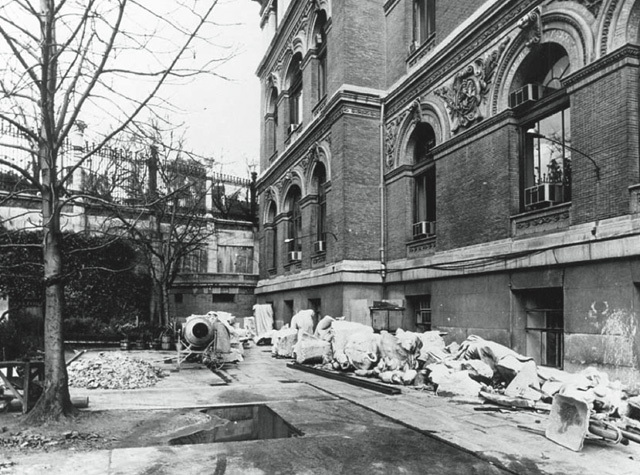 As the bronze copies were completed, surmounting the roof in 1975, the marble was cut up into smaller pieces for easy transport and haphazardly lined along one side of the building. Apparently the roof of the Ministry of Development was only able to carry this load for 67 years. It now required a lighter and cheaper copy of the monument, originally loaded with a lot more than it can carry. With its roots from the quar- ries on Italy’s west coast, the monument, which was in the commons of Madrid’s citizens, had now turned into a threat to public safety. The contradictions that arose from this accident were not limited to this. The monument intended to represent mastery and stability had now come to represent displacement and transience through the copies that had replaced their originals. Could Madrid be the site of reproductions; a secondary zone instead of the center of progress and modernity? In 1989, it was decided that the abandoned and obsolete marble originals would be restored. After visiting two other masonry workshops in Madrid, the heap that consisted of 60 large and 400 smaller fragments were moved to a workshop on Áncora Street (Calle Áncora), where the statues could finally be restored. 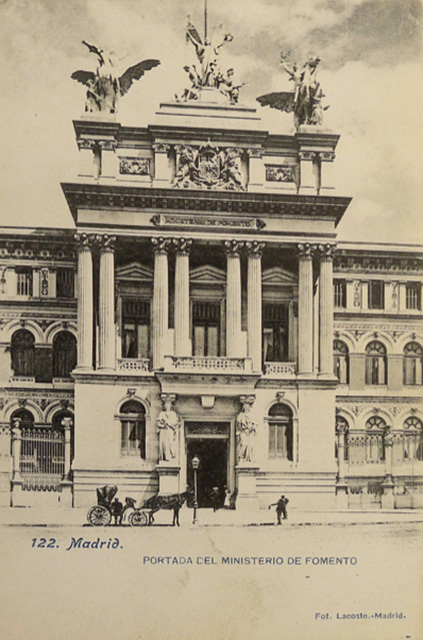 It was decided that they would be placed on Principe de Vergara Street (Calle de Principe de Vergara), in a configuration resembling their original assembly on top of the Ministry. The first sculpture to leave the workshop was Victoria. Almost fully restored at this point, lacking only its arms and wings, it was carried to its new location. This was when the authorities realized that they had calculated the final weight of the sculptures without taking into account their pedestals. The additional weight meant that placing the sculptures at the determined location was impossible. While looking for a new location, authorities kept Victoria on Principe de Vergara Street (Calle de Principe de Vergara) for five years before moving it back to the workshop where the restoration of the Pegasuses continued. Meanwhile, a new location for the sculptures was found. A year later, Victoria was placed on the Cádiz Roundabout (Glorieta de Cádiz) while the Pegasuses were placed on Legazpi Square (Plaza de Legazpi), separated from Victoria by Andalusian Bridge (Puente de Andalucia). In 2005, when work on the M-30 highway began, the weight of the statues once again became problematic. It was decided that the Pegasuses would be moved back to Áncora Street (Calle Áncora) and kept there while work on the highway continued. Iron cages were built to aid in transportation. However, a technical failure during this operation caused the loss of other wings—the workers cut off the wings that coincided with the diagonal supports of the cages. Furthermore, one of the Pegasuses was somehow left on Legazpi Square (Plaza de Legazpi), despite having lost one of its wings. 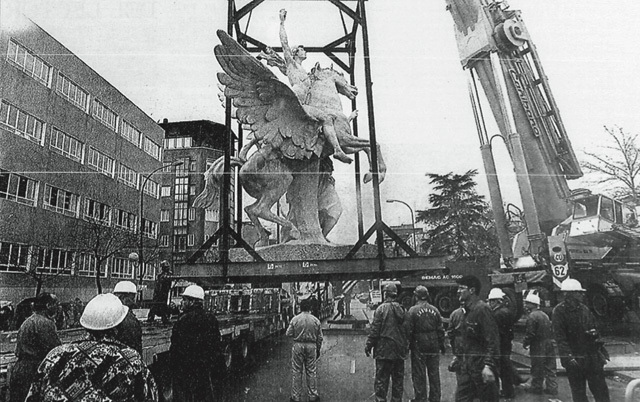 27.01.1997, El Pais, “Los Pegasos Vuelan al Sur.” The arrival of the restored Pegasus at Plaza Legazpi. Sibel Horada’s first encounter with the monument was in January 2013 on this very same Legazpi Square (Plaza de Le gazpi), which still acts as the southern gate to the city despite its current desolate condition. The single Pegasus cov- ered with fabric, perhaps to conceal its broken wing, stood obstinantly in the middle of the square, like a disgrace that had to be hidden from sight. It was Sibel’s curiosity about what was hiding under the cloth that drove her to investigate further, like an archaeologist traveling in time. She searched through historical records with great hunger and curiosity and looked for its lost wing in an attempt to uncover the details of its journey. The clues she found revealed a story—not of a series of triumphs as one would expect, but of destruction, displacement, and reproduction. She first encountered the broken wings and the copies made to replace them in the warehouse on Áncora Street (Calle Áncora), accumulated out of sight like a secondary monument. The remnants of history and its errors had constructed their own monument. How could the Victoria and the Pegasuses survive in a heap of remnants and mistakes? From the Middle Ages to the Renaissance, the Pegasus was a symbol of wis- dom and fame, a source of inspiration for the romantic poets of the 19th century, a symbol of water, the sun myth and the shaman mountain, and according to Jung, the horse of spirituality that carried mortals to the land of Gods.The god- dess Victoria (Nike) ran fast, flew fast, and symbolized victory. The life of Victory and the Pegasuses had begun in Madrid as an attempt to enhance the spirit of victory; as it was presented to public commons. However, time fostered them with its yearning for disappearance, dissimulation, loss, and decay. Instead of carrying the weight of history, the monument simply threw it off its back. Today, it seems as if the monument came into existence in order to reveal the inevitable contradictions of a system that promised daily progress in art, science, commerce and conquests. Today, the Pegasus with the broken wing rises to the sky in the middle of Legazpi Square (Plaza de Le- gazpi) like a bump covered in an effort to conceal its shame, like dust swept under the carpet, like an elephant in the room. Today, Sibel adds yet another layer to this story of displacement. She replaces the lost piece of the monument with a new one in Istanbul. A 3D computer model of the original wing was created in the warehouse on Áncora Street (Calle Áncora), carried to Istanbul in the form of a digital file, and recreated here in its original size. This was achieved by making fiberglass moulds of ten separate pieces of Styrofoam which were mechanically carved by using the digital data, and stitched together to constitute a whole wing. Its surface was then covered by a rough mortar made by mixing crushed marble, white pigment and polyester resin. The fact that the wing now exists as a computer file and can thus be recreated endlessly in any desired size obstructs the permanence of iconic ges- tures. The reproduced wing plays with volume, space, and material; it empha- sizes transience, destruction, mobility, and the conditions brought forth by his- torical context and life. The existence of the wing corresponds to a legend that erodes as it spreads by word of mouth, and which multiplies while it lessens. 28.05.2013, 07:55, Calle Áncora. Photo by Ícaro Maiterena. In talking with Sibel, I can see that this story has become a kind of strange obsession for her. I suppose that such an obsession can only grow to this point if it’s combined with a personal story of loss. Can the history she wove, bringing together the data like pieces of a puzzle to find the lost wing, be mirroring a personal story of loss waiting for its completion? Can the source of this obsession be explained in any other way than an attempt at tracing what one has lost, in an accumulation of wings in some remote corner of Madrid; a quest for something lost, something whose existence is known and yet cannot be seen? How else can we explain her irresistible drive to collect the traces of the wings and bring them back to Istanbul with the knowledge that she would lose them im- mediately after finding them? Sibel tells me that she realized that the verb record in English comes from the same root as the Spanish word for remember (record- ar). These two can sometimes mean the same thing. Contrary to what we have been taught, memory and history can converge at the same point. In Istanbul, the wing will be displayed with the historical material that documents its life. If Sibel were to reproduce the wing, isolated from its identity and these historical details, the result would be nothing but a precious art object dom- inating the gallery, revealing nothing but the traces of the physical process that created it. If the documents that tell the story of the broken wing were not dis- played, the wing would continue its life in Istanbul as pure mystery. On the other hand, presenting the historical documents beside the wing is far from being a solution as they can only increase the number of potential questions.The docu- ments surrounding the copy of the wing summarize its journey, turning it into pure myth, narration, and legend; just like the narrative I pieced together in a house in Venice on Traghetto di Santa Lucia Street (Calle del Traghetto di Santa Lucia) with the help of the documents Sibel has sent me by e-mail, tracing the life of the wing from Carrara to the squares of Madrid, and from Áncora Street (Calle Áncora) to Istanbul. The transport of the wing from Madrid to Istanbul (from a public square to an exhibition in a private gallery) is by itself pregnant with many new stories. In Istanbul, evidence of ancient cultures lies concealed in old museums, with little continuity into present-day life. This wing is called “A Fall” in Istanbul, where classicism has not been renewed, where monuments do not have wings, and also where historic monuments are endlessly reproduced in recreational areas for the sake of nostalgia; empty and echoless, shiny and vivid as if they have never been a part of history. It seems that in Istanbul, the story of this wing will recall many other states of destruction and re-construction. Charcoal rubbings of the wing fragments on fabric from Áncora Street. Nazlı Gürlek is an independent curator and writer based in Istanbul, where she is Vice President of AICA Turkey. She obtained an MFA in Curating at Goldsmiths College in London (2008), and a BA in Painting at the Academy of Fine Arts in Florence (2006). She was Assistant Curator of the Pavilion of Turkey at the 53rd Venice Biennale (2009), and curated a number of solo and group exhibitions including BENGÜ BURAK VOLKAN ALP ELMAS İZ (Maçka Sanat Galerisi, Istanbul, Sept 2011–June 2012), Shared (5533, Istanbul, 2012), The Riot Act (Galerie Mor Charpentier, Paris, 2011), İnci Eviner (Nesrin Esirtgen Collection, Istanbul, 2011), Rehearsal (Gallery Non, Istanbul, 2011), and Fold (Elgiz Museum of Contemporary Art, Istanbul, 2011). Recently Gurlek curated DIYALOG: Art From Turkey at the Vienna Fair, The New Contemporary (September 2012); and co-organized an AICA Turkey event, a series of talks entitled CONTEMPORARY ART IN TURKEY FROM 1980’s TO PRESENT: TESTIMONIES AND SHARED EXPERIENCES at Mimar Sinan University of Fine Arts, Istanbul. Her writings have been published in Flash Art International, Sanat Dünyamız, and Frieze Blog, among others. Gürlek is the author of ‘Sarkis and When Attitudes Become Form’, SALT Istanbul. 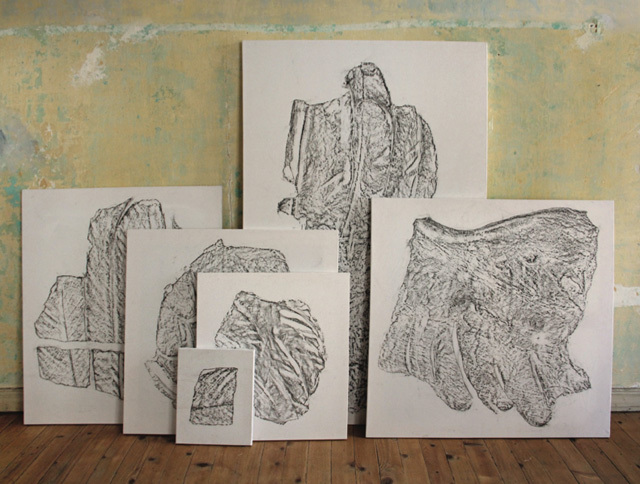 She was the curator-in-residence at the CCA Ujazdowski Castle in Warsaw in July 2013, and a participant in Independent Curators International’s Curatorial Intensive in Derry-Londonderry and Curatorial Seminar in Istanbul. Posted in content, on artists and tagged Daire Sanat, Madrid, Nazli Gurlek, Plaza Legazpi, Sibel Horada, Victory and the Pegasuses. Bookmark the permalink.